I am wondering if any of the other WA members would like to start a research group. We could pool resources and knowledge. Follow up on any reports and just get out and about to see what we can stir up over here in the West. Email me this week sometime - dean@yowiehunters.com and I'll point you in the right direction. There's more happening over there than we think. I think whatever time anyone one could spare would be great. Another set of ears and eyes whem they can be there can only help. Would love to be involved but I'm waiting on 2 knee replacements so very limited at the moment. Hey senses I reckon some light bush walking could be good for recovery when you're ready! If you bought them on eBay and they come from China you just have to be patient! gregvalentine wrote: If you bought them on eBay and they come from China you just have to be patient! I dont know about anyone else but the curiosity got the better of me and I had to look up Knee Replacements on eBay, fortunately for senses sake you cant get Knee Replacements from china. However you can get, to my surprise a book...... "A Beginner's Guide to Total Knee Replacement (Alongwith 5 Surgical Video DVDs 2" if one was desperate. I've had one knee done (right) and before that a hip (left), and now my left knee looks like it might have to be done also. It's a bugger getting old and your bits wearing out. NB Original post by me was not meant to be taken seriously. gregvalentine wrote: NB Original post by me was not meant to be taken seriously. Yeah I know..... your posts are always filtered with a bit of sarcasm. Anyway back on topic WA is a big place, I am guessing most of the research will be conducted or based around Perth. I'm based in the northern suburbs of Perth so at this stage more than likely around the Perth region but we do have alot of state forest and national parks within a reasonable travelling distance with activity in or near by. Most of the sightings I'm aware of are in the south western part of the state, with the exception of Exmouth. I personally have done some reaseach in the Avon Valley, Mundaring and Dwellingup with some interesting results (although unconfirmed). I have also been asked to follow up with some witnesses. I personally would be more than happy to travel (within my own budget constraints) for reaseach and longer expeditions could be conducted on long weekends etc. 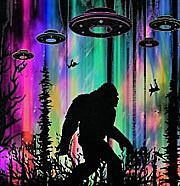 I do think we have a population of Yowie's aswell as Woodarchies (Junjadee's) over here and further investigation is definately warranted and I think an extra researcher or two make you feel a little safer in those "what the @#$% was that" moments. gregvalentine wrote: I dont know about anyone else but the curiosity got the better of me and I had to look up Knee Replacements on eBay, fortunately for senses sake you cant get Knee Replacements from china.However you can get, to my surprise a book...... "A Beginner's Guide to Total Knee Replacement (Alongwith 5 Surgical Video DVDs 2" if one was desperate. I was traveling to York along Great Eastern Hwy last Saturday and was thinking about the strong possibility of Yowie activity in the surrounding forest. The forest covers a vast area starting from the edge of the highway. Quite a few truck bays and gravel tracks leading into the bush and I reckon it would be a great spot for a night surveillance. No Yowie reports to my knowledge but the area being so large would give them ample opportunity to travel about without being detected. sensesonfire wrote: I was traveling to York along Great Eastern Hwy last Saturday and was thinking about the strong possibility of Yowie activity in the surrounding forest. The forest covers a vast area starting from the edge of the highway. For those who might be interested I've set up a facebook page for WA research it has links to the WA sightings. I've put some photos up of sime possible markers. I've got my Youtube channel up and running now. I'll be trying to get out at least once a week doing recon in different areas and collaboratiing with Yowies Down Under In WA for some investigations. We have found a few other guys that are interested over here and new information from witness encounters is starting to come through. Also I am now writing an article for the Yowie Times called West Oz News. So keep an eye out if your interested in what's happening in the west. For anyone who might interested here is my latest expedition. Looks like a nice bit of wilderness you are in there Slats. Good luck with the audio! Thanks mate it is a pretty good spot and definitely fingers crossed on the audio. On the southern side of the river my youngest son and I were stomped and tree slapped at by something behind a parrot bush thicket one night camping. I'll show everyone the river when I collect my recorder look for sign on the banks. Well it sounds like you have good reason to be having a look out there then. Looks a likely area. Lets hope you get something interesting!